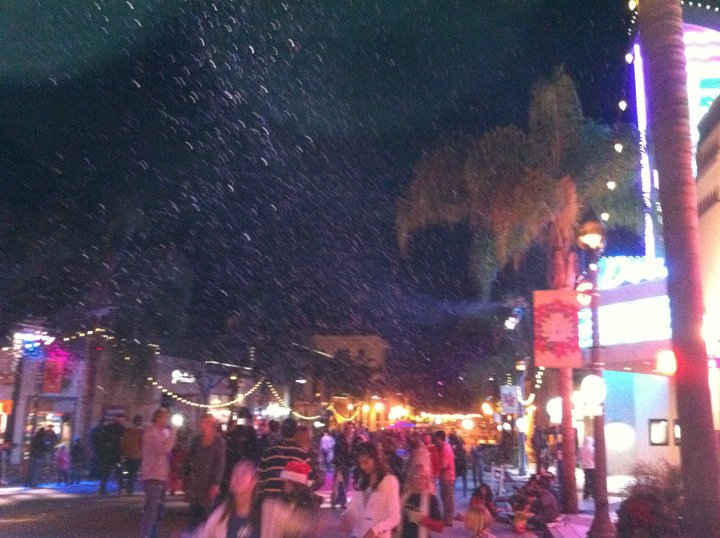 Downtown Ventura was quite the happening holiday scene last Saturday night. As the streets cleared of vendors following the Holiday Street fair, the Main street as well as side streets stayed closed. Near California and Main, “snow” fell to the delight of many while down California at Santa Clara at the corner park, carolers sang amongst newly lit trees. And amongst all this holiday cheer, the 1500 people who bought $40 bracelets and tickets to sell out the first Winter Wine Walk packed participating stores and swarmed sidewalks carrying plastic glasses filled with wine! I admit is was a bit shocking to see so many people wandering the streets, plastic glasses in hand. Plenty of police on hand said nothing, but I can’t imagine that will happen again! Since my husband wanted to go to WAV for Indian music and food instead of doing the wine walk, we passed on buying bracelets for the event. However, we did check out the scene and some of the wines. At one stop, the owner comped us tastes, but the wine was not that great so it will go nameless. At the Ventura Visitors Center, I finally met Sequioa Hamilton who leads travel and writing workshops around the world (Egypt on 1/11/11 anyone?) She shared an extra ticket with me and I tasted a reasonable cabernet. After an amazing performance at WAV, we walked along Santa Clara and stopped at Zoey’s where Cantara Cellars was pouring. As Chris Brown and I are facebook friends, I wanted to meet her and her husband the winemaker in person AND try their wines if possible. They had a full compliment of their wines available but since I want to experience their tasting room and facility and plan to write a full blog post about them soon, I went for the wine I was most curious about: their Frankenvine. Even though the wine was a bit warm and in a plastic cup, the wine was certainly no monster. In fact, both my husband and I really liked this wild blend of cab, syrah, zin, and whatever else seemed like a good idea at the time. I was less impressed by the Lodi Old Zin but I want to give it another swirl–I don’t think the circumstances gave the wine justice. As a wine blogger who typically tastes at industry settings and other professional venues like Wine Bloggers Conferences, this was not really my kind of event–although I am sure I would have had a good time, tasted some memorable wines, and made some great contacts for future blog posts. I just hate to taste or drink wine from plastic glasses, I didn’t like how crowded the many of the venues were, so we didn’t even bother to walk in, and it really seemed like people were out to drink and not really taste and experience a broad range of wines. Cantara was in a tiny booth way in a back corner at Zoeys which was far from opportune. I really want to learn more about the wines and experience more deeply what I am tasting. If they do it again, I hope they give people real glasses–or else I suppose I could bring my own. But for the hordes of people out for Ventura’s Winter Wine Walk, the event was a huge success. Everyone seemed deliriously happy. And after selling out 1500 tickets at $40 a pop, I am sure the organizers popped champagne and drank it in a plastic cup all the way to the bank. As for us, we decided to leave downtown and possible traffic hazards for the calm, quiet and excellent food of The Sidecar where we were deeply satisfied and delighted by a simple meal of cream of mushroom soup, their interpretation of a caesar salad, a second green salad, and excellent bread with a 6 ounce glass of crisp, refreshing Beckman Sauvignon Blanc that went wonderfully with my caesar salad. Which Wine Goes With Which Cheese?